This year I was lucky enough to be one of the professional critics taking part in the Resolution Review programme alongside Resolution, The Place’s annual showcase of new choreography. See below my reviews, originally published here. Under a single light bulb, Subhash Viman writhes restlessly on the floor. Limbs trembling, contorted, he is like a man learning to inhabit his own body. It’s a sense of searching that knits together the otherwise disparate triple-bill on the third night of Resolution 2016. Drawing on the ancient Chinese poem San Zi Jhing, Shan contrasts these jerking, shuddering movements with the fluidity and control of learnt gestures, suggesting the forces that society exerts on the body. Though the progression of the piece fails to match its startling opening, it’s a showcase for an astonishing talent in the form of Viman. The evening’s second offering, to borrow its title, is Finding Words – or, rather, struggling to track them down. The programme note promises an exploration of ‘the urgency of language’, but there’s little that is urgent about Wayward Thread’s muddled piece. In a disjointed series of sequences, break tussles with contemporary dance, as the red-swathed company of seven creates shapes and images that struggle to speak to one another. There are occasional, tantalising hints of the epic, but the work as a whole never quite discovers what it’s looking for. Closing the night in riotous style, Mad Meg is a search for its eponymous protagonist. Fragmenting and subverting the fairytale genre, this marriage of dance, narration and live folk music reclaims the story of a woman serially ignored. Defiant, joyous and often brilliantly grotesque in its use of movement, MAZPOD’s feminist fable is also bags of fun. 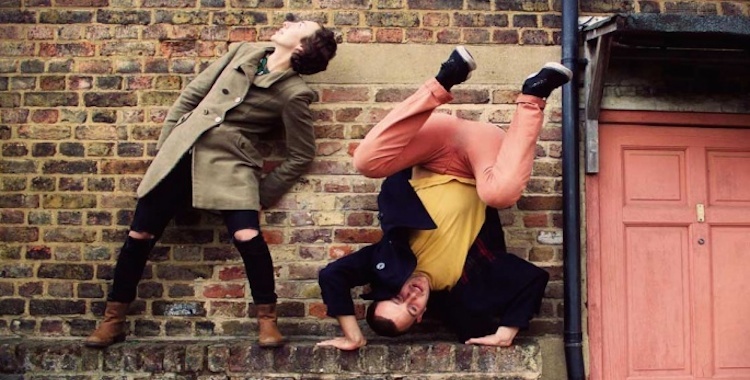 It helps that performers and choreographers Marianne Tuckman and Phoebe Ophelia Douthwaite have a fizzing onstage chemistry, reminiscent of sparky physical theatre duo RashDash. The structure needs some work and the storytelling lacks clarity at times, but with energy and wit like MAZPOD’s such flaws are easy to forgive. As the lights come up on Next Door, a sofa sits centre stage. It’s an item of furniture that suggests staid living room dramas, but aKa Dance Theatre Company transforms it into a third player in this compelling study of one couple’s relationship. It pirouettes, tips on its side, embraces or ejects the two lovers who clamber over it. Throughout, Jennifer Grant’s playful and often surprising choreography tiptoes the fine line between flirtation and frustration. Curling their bodies around one another, Joe Garbett and Sally Smithson are teasing one moment, stony serious the next. Without words or even music, they suggest all the ways in which love can both make you soar and tug you painfully back down to earth. In the second duet of the evening, Poekert & Bysheim’s oh, and one more thing…, the two dancers are held apart by rigid external structures. Stark shafts of light carve up the stage, restricting Sarah Poekert and Lisa Colette Bysheim to their own small portions of space. Beginning with micro-movements that gradually expand outwards, the two performers push at these boundaries, seeking fleeting moments of connection. The central idea, though, is more interesting than its stiffly repetitive execution. Connection and disconnection are also key themes in Building the Route Between Me and You. BAMBULAproject are interested in how we piece together fragmented societies, a process represented visually on stage by a series of interlocking tiles. Sliding these tiles around the space and slotting them into different formations, the four dancers explore both isolation and togetherness. In one absorbing sequence, two of the performers create winding paths for their fellow dancers, slowly bridging the distance between them. While the dramaturgy of the piece as a whole would benefit from more clarity, at its best it speaks powerfully to how individuals connect and collide in the modern world. “The creative act,” as Marcel Duchamp famously asserted, “is not performed by the artist alone.” Art – and performance particularly – needs audiences to come to life. Opening the evening in baffling style, Christopher Owen’s new piece has taken Duchamp’s mantra to heart. Choreographing music, sound, video and text, as well as the movements of his own body, Owen creates an assault on the senses. The burden of meaning lies entirely with the audience. This, strange, puzzling piece acts as an association machine, its fleeting flashes of video and text daring us to make mental connections between disparate images and ideas. Disparate is a word that jumps to mind again watching That’s Not How He Wants It. Individual sequences in Dillon Dance’s offering are all beauty and control. The female performers assume poses of fixed elegance, locked in place like ballerinas in jewellery boxes. In other scenes, they break free, their movements implying both strength and frustration. The title is suggestive of women’s roles in society and the extent to which these are still determined by men, but this theme is hinted at rather than fully realised, while the scenes themselves feel only loosely connected. The clarity that’s wanting elsewhere is finally found in the night’s concluding piece, The Rebirth Network’s Behind me. This fusion of hip-hop, dance theatre and spoken word vividly evokes an inner world of competing voices and personal demons. There’s a rare dynamism and chemistry to this ensemble, who work brilliantly together to command the stage. Bodies convulsing to distorted beats, the performers create a haunting and compelling vision of hidden turmoil, all building to an urgent final message. Unlike the Rubik’s Cube that various company members grasp in their hands, dance is not there to be solved, but The Rebirth Network welcome audiences into the puzzle rather than locking them, bewildered, outside it. There’s a lot going on in Muti Musafiri’s ReFractions on Attachments. Perhaps too much. Four dancers enter, eating oranges and reciting juice-distorted lines of poetry, before segueing into a series of movement sequences. One performer emerges, limb by limb, from between the legs of another. Bodies move fluidly in and out of frozen poses, limbs seemingly manipulated by external forces. The dancers race – flailing as though dragged – towards the audience, stopping at the last second. Such moments are individually stunning, and the talent and control of the quartet of performers is indisputable, but the connections between these scenes remain stubbornly opaque. In contrast with Musafiri’s soup of ideas, Richard Osborne’s rEd is all simplicity. Billed as a duet about identity, it’s just that. Performers Brita Grov and Pola Krawczuk repeatedly come together and tear apart, fiercely tussling for a sense of individuality. Red and white hazard tape ties them together like an umbilical cord, pulled taut in striking images of struggle. “This is me,” Grov insists, mantra-like, trying to break free. The piece’s simplicity, though, is its weakness as well as its strength. Ambition has been sacrificed for the sake of clarity, never allowing this investigation of identity to go more than skin deep. The individual and the group are also two of the central concerns of Hyena, Alula Cyr’s blend of circus and contemporary dance. The three female performers, like the animal of the title, move in a pack. As they execute a series of gasp-inducing acrobatics, the women also playfully explore group dynamics, as different individuals pair off or compete for one another’s attention and approval. This aspect of the piece, while intriguing, is not yet fully developed, and the skilful trio are at their best when rotating in wheels or turning unlikely somersaults. Ultimately, spectacle wins out over storytelling.